This won't be the first Subway Series we've seen with Curtis Granderson and Carlos Beltran suiting up for the opposing sides. But Beltran as a Yankee? And Granderson as a Met? Nevermind the likes of Bartolo Colon and Kyle Farnsworth, who've played for both teams. Oh, and this is Derek Jeter's last taste of the rivalry. But those are just some of several fascinating storylines as the first game of the 2014 Subway Series kicks off Monday night. The starters are Hiroki Kuroda (4.43 ERA, 1.24 WHIP) for the Yankees (19-7) and Bartolo Colon (5.36 ERA, 1.37 WHIP) for the Mets (17-9). The first two games will be at Yankee Stadium, followed by two more at Citi Field. Follow along with our live chat pulling in pictures and videos from the game, plus stats, analysis and news from our Newsday crew at the park and in the office. Make sure you join the conversation, too! We're a little tight on space so we're condensing the big Mets news: Saul Katz has been called up and he's starting Wednesday vs. the Yanks. Is there anything you want to know about the Subway Series? The stats of any player involved since the series inception? Who won, lost, got the save, was the manager? The winningest and losingest pitchers and hitters for each time? 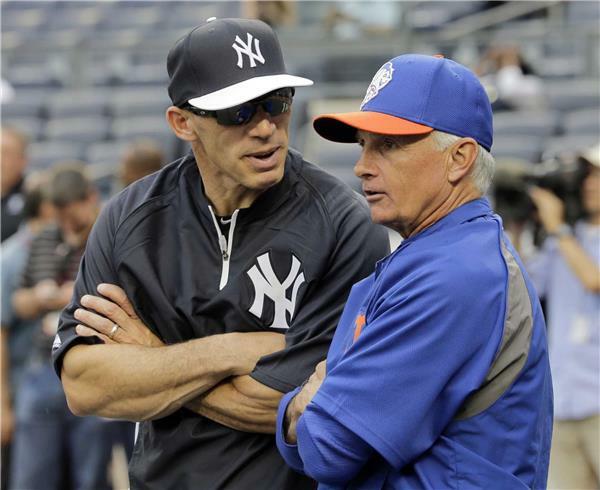 NewsdaySubway Series Yankees vs. Mets history including boxscores, statistics, all-time leaders and more from MLB's New York-New York interleague baseball rivalry. The Mets shook up their pitching staff on Monday night, moving Jenrry Mejia to the bullpen to make room for prospect Rafael Montero, who will make his big league debut on Wednesday night in the Subway Series. Meanwhile, pitching prospect Jacob deGrom may also be called up this week, where he could be used to help steady what has been a shaky bullpen. General manager Sandy Alderson said deGrom was scratched from his scheduled start today with Triple-A Las Vegas in case he’s summoned to New York. Behind Noah Syndergaard, the 23-year-old Montero is the Mets’ most highly-touted pitching prospect. He’s 4-1 with a 3.67 ERA with Las Vegas. Rival scouts rave about Montero’s strike-throwing ability and believe the righty is ready to face major league hitters. Meanwhile, Mejia will work out of the bullpen starting Monday night against the Yankees. He has been outspoken in his desire to stay in the rotation, citing fears about whether his arm can withstand the stress of pitching out of the bullpen. But Mejia has continued his long-established trend of fading late in his starts. Meanwhile, Alderson acknowledged the team’s pressing need in the bullpen, which has struggled with consistency. Yankees starter Hiroki Kuroda has only given up more than three runs twice in seven starts this season. He's also displayed excellent control, striking out 33 and walking just seven. During his last two starts, he's thrown 13.2 innings, allowed 12 hits and one walk and struck out 15. Kuroda has been particularly effective at Yankee Stadium. Though the venue is known for being a hitter's friend, Kuroda has controlled the opposition in the Bronx. He has a 2.88 ERA in 27 starts there. Kuroda, however, has a 4.30 ERA at Citi Field, so it might be fortuitous that his rotation turn comes tonight instead of later in the week. Bartolo Colon's unsightly 5.36 ERA has really been bloated by two awful performances. In his seven starts, he's given up three runs or fewer five times. But, oh, those other two: nine runs in five innings and seven runs in 4.2 innings. Take those two starts out and Colon would have a 2.64 ERA. But even with those awful starts, Colon has shown good stuff, walking only five hitters all season and striking out 34. But those blowups by Colon are still cause for concern. Prior to this season, he hadn't allowed more than six earned runs since May 10, 2012. Granderson standing next to Gardner in CF during anthem. In 17 career games against the Yankees (16 starts), Colon has a 5.77 ERA with a 1.47 WHIP. Last season, however, in two starts against the Yankees, Colon had a 2.38 ERA with Oakland. Broadway's Bryce Pinkham with maybe the best Anthem we've heard this season. Bartolo Colon hasn't started a game in Yankee Stadium as an opposing pitcher since 2007. For his career, he has a 5.35 ERA in six games (all starts) as an opposing pitcher at Yankee Stadium. Some boos for Granderson. 1% of the boos for Cano. 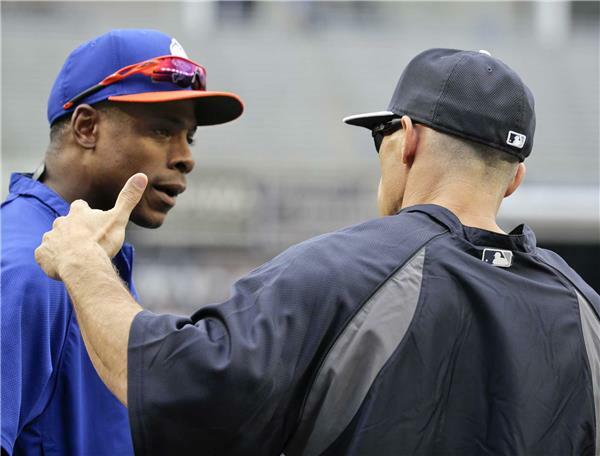 Granderson hears more boos daily at Citi Field. Colon pitched for the Yankees in 2011. That season he posted a 4.68 ERA at Yankee Stadium and a 3.45 ERA on the road... so Yankee Stadium has largely not been a place where Colon has succeeded, either as the home pitcher or opponent's pitcher.
. . . Ceremonial first pitch thrower before the first game of the 2014 Subway Series is . . . No one. 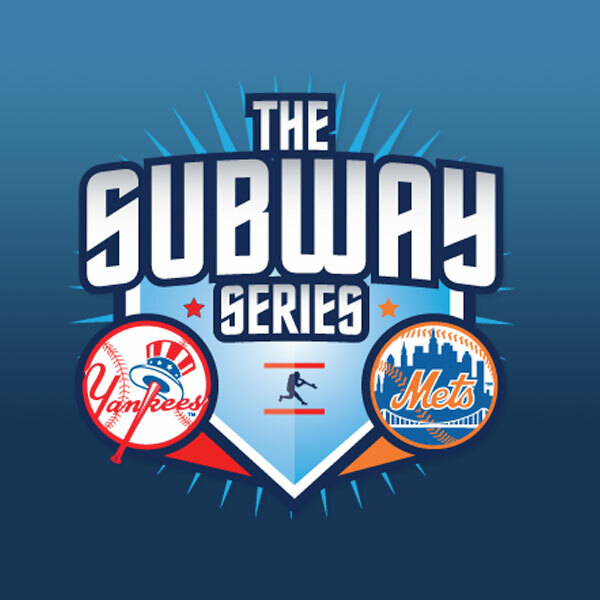 The Subway Series turns 18 tonight! It's too cool for a ceremonial first pitch. 7:09 pm first pitch here in the Bronx. EYJ starts it off quickly. He and Gardner should have a foot race later. Yanks and Mets wearing special caps. White brims for Yanks, orange for Mets. Huge group of orange clad Mets fans in leftfield second deck. Making lots of noise. I see the @The7LineArmy has invaded Yankee Stadium. Now serious boos for Granderson. That makes less sense than boos for Cano. yes RT @kcaps10 : @MarcCarig think Mejia is available tonight in pen? The INCREDIBLY speedy Billy Hamilton (Reds) has 12 stolen bases and has been caught stealing five times. So EY jr.'s 93.7 percent success rate this year is really something. Both hits have come on Kuroda's sinker. Wright's RBI groundout also came on a sinker. a.) City/State b.) TV/radio/mlb.com c.) Eric Young Jr. and Brett Gardner in a foot race. Who wins? Here comes Bartolo Colon, yet another ex-Yankee facing the Yankees this evening. The MT25 is apparently offline. Entire sections of box seats on the lower level in right and left are unoccupied. Couldn't more Mets fans have made it tonight? Hiroki Kuroda faced five batters during the first inning, allowing a run on David Wright's RBI groundout...but he still needed only 14 pitches to get through the frame -- 10 of which were strikes. Colon, also threw 14 pitches in the first inning - 10 of which were strikes. All the fans in LF could be San Francisco Giants fans. Or the Phoenix Suns. Or the Dutch national team.